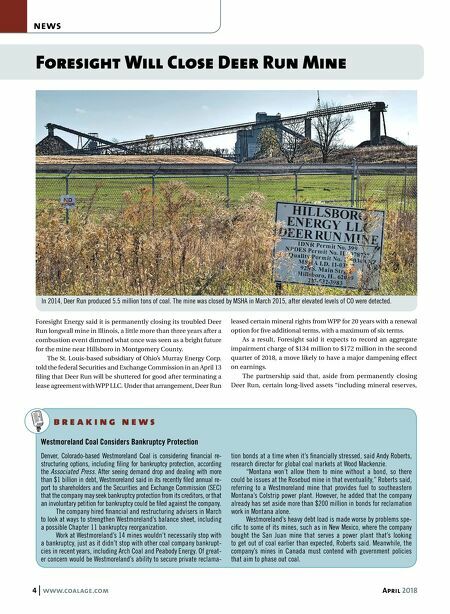 4 www.coalage.com April 2018 news b r e a k i n g n e w s Foresight Will Close Deer Run Mine Foresight Energy said it is permanently closing its troubled Deer Run longwall mine in Illinois, a little more than three years after a combustion event dimmed what once was seen as a bright future for the mine near Hillsboro in Montgomery County. The St. Louis-based subsidiary of Ohio's Murray Energy Corp. told the federal Securities and Exchange Commission in an April 13 filing that Deer Run will be shuttered for good after terminating a lease agreement with WPP LLC. Under that arrangement, Deer Run leased certain mineral rights from WPP for 20 years with a renewal option for five additional terms, with a maximum of six terms. 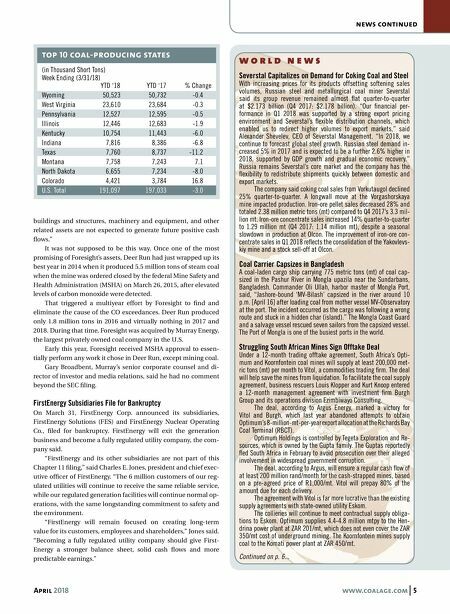 As a result, Foresight said it expects to record an aggregate impairment charge of $134 million to $172 million in the second quarter of 2018, a move likely to have a major dampening effect on earnings. The partnership said that, aside from permanently closing Deer Run, certain long-lived assets "including mineral reserves, Westmoreland Coal Considers Bankruptcy Protection Denver, Colorado-based Westmoreland Coal is considering financial re- structuring options, including filing for bankruptcy protection, according the Associated Press. After seeing demand drop and dealing with more than $1 billion in debt, Westmoreland said in its recently filed annual re- port to shareholders and the Securities and Exchange Commission (SEC) that the company may seek bankruptcy protection from its creditors, or that an involuntary petition for bankruptcy could be filed against the company. The company hired financial and restructuring advisers in March to look at ways to strengthen Westmoreland's balance sheet, including a possible Chapter 11 bankruptcy reorganization. Work at Westmoreland's 14 mines wouldn't necessarily stop with a bankruptcy, just as it didn't stop with other coal company bankrupt- cies in recent years, including Arch Coal and Peabody Energy. Of great- er concern would be Westmoreland's ability to secure private reclama- tion bonds at a time when it's financially stressed, said Andy Roberts, research director for global coal markets at Wood Mackenzie. "Montana won't allow them to mine without a bond, so there could be issues at the Rosebud mine in that eventuality," Roberts said, referring to a Westmoreland mine that provides fuel to southeastern Montana's Colstrip power plant. However, he added that the company already has set aside more than $200 million in bonds for reclamation work in Montana alone. Westmoreland's heavy debt load is made worse by problems spe- cific to some of its mines, such as in New Mexico, where the company bought the San Juan mine that serves a power plant that's looking to get out of coal earlier than expected, Roberts said. Meanwhile, the company's mines in Canada must contend with government policies that aim to phase out coal. In 2014, Deer Run produced 5.5 million tons of coal. The mine was closed by MSHA in March 2015, after elevated levels of CO were detected.